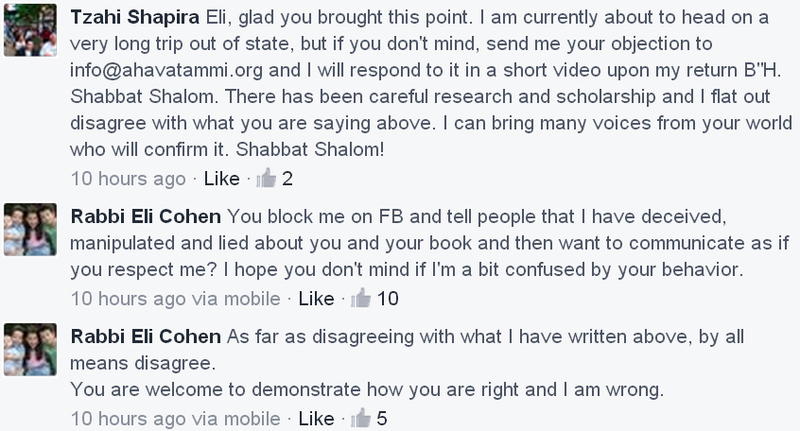 Below is a response by Rabbi Eli Cohen for which fake “rabbi” Tzahi Shapira is not too happy about. In the picture below is a summary of the state of play. OK. So let’s try with one example from the book The Return of The Kosher Pig (TROTKP)This is NOT a full review.This is merely one example of the author’s misunderstanding, misquoting, misinterpreting and misapplying the sources he quotes. To disprove a claim takes more time than to make one, so please bear with me. I have tried to stick to one point so as not to loose the reader. The author’s first stop (TROTKP p. 12 -14) to support his theory that the Hazir (pig) is a reference to the messiah is Rabbi Yehudah Hayon’s book Otzarot Acharit Hayamim Volume 1 Chapter 12 which can be accessed here http://www.aharit.com/A-12.html This chapter (12) of the books is dedicated to the discussion about the status of the commandments of the Torah in the messianic age. I have provided here a loose translation of the Hebrew together with a summary of the points made by Rabbi Hayon. The first commandment Rabbi Hayon lists is the biblical prohibition to consume Hazir (pig). He refers to the biblical prohibition with simple writing the word “Hazir” and then gives us the relevant quote that indicates that in the messianic era this prohibition will no longer be in effect. Here is the full quote from Rabbi Hayon. “Hazir – “Why is his name called Hazir? Because The Holy One Blessed Be He is going to return him to Israel”. That’s all Rabbi Hayon writes in the body of the article relating to the Hazir. In his endnotes to that chapter (endnote 30) Rabbi Hayon briefly references various authors who offer ways of interpreting that Midrash. The author of TROTKP quotes from Rabbi Hayon’s endnote 30 and provides his understanding of Rabbi Hayon’s words. Allow me to summarize what Rabbi Hayon writes in his endnote (which you are welcome to study for yourself in the original at the web address I provided above) and then I will highlight the erroneous understanding of the author of TROTKP. Since the original quote of the Midrash is nowhere to be found in all the Midrashic material available to us today, some rabbinic authorities actually dispute the existence of such a Midrash. Rabbi Hayon,states that since he personally hasn’t been able to find the original Midrash, he felt the need to reference the works of those venerable Rabbis who quoted this Midrash in their own respective writings. The sources that Rabbi Hayon brings in his endnote offer a variety of possible interpretations of the Midrash in question. Rabbi Hayon cites these sources in order to offer the reader four ways of reconciling an apparent contradiction between the pig returning to Israel in the messianic age and the principle that the commandments of the Torah are eternal and cannot be changed. 1. The Midrash can be understood in accordance with the opinion that the Mitzvos will become “nullified” after the resurrection of the dead in which case the principle of “Bameisim Chafshi” – “the dead who are free” will apply (which means that those who are resurrected are free from the obligations of the commandments. In other words, the discussion about the pig being permitted is a discussion that pertains to the time of the resurrection of the dead thus not posing a theological challenge. 2. The Midrash can be understood in accordance with the opinion of the Ohr HaChayim that since the circumstances in the messianic era will change (i.e the pig will begin chewing its cud) therefore the prohibition will no longer apply. The Ohr Hachayim understands the specific usage of words in verse 7 of Leviticus 11 to be alluding to the fact that the prohibition of consuming pig is only due to the fact that it does not chew its cud at this point in time. In the future, however, when the pig will chew its cud it will be permissible for consumption. Thus, the consumption of pig is (so to speak) an exception to the rule of the non-changing nature of the commandments (although the commandment doesn’t really undergo a change, but rather the circumstances change). 3. The Midrash can tbe understood allegorically in one of the following explanations of the Radvaz. A. Not that pig will literally be permitted, but that there will be such a great abundance of meat consumed in the messianic era that it will be “as if” pig has been permitted. B. The Hazir (pig) is an esoteric reference to an angel named Hazri-e-l who is a prosecutor of Israel and will in the future be transformed (lit. returned) to become their defender. 4. The two versions of the Midrash cited by Rabeinu Bachaya (Pashas Shemini) are entirely different versions to the most common version of the Midrash quoted by the Ritva and Radvaz etc. Rabbi Hayon – expecting the reader of his book to look up there reference in the original for a fuller context and explanation – doesn’t quote the entire Rabeinu Bachaya. Rabbeinu Bachaya goes on to explain that the second version of the Midrash – “[Why is this nation (Rome) compared to a pig?] Because in the future the crown will be returned to its former glory.” – refers to the forth kingdom (Rome) coming in the future and rebuilding the Third Temple (since they destroyed the second Temple). Now let us turn TROTKP and the authors (mis)understanding of Rabbi Hayon. In other words, the author of TROTKP is trying to find support from the words of Rabbi Hayon for his thesis that the pig alludes to the messiah and that when the Rabbis speak about the return of the pig it is a euphemism for the messiah. The problem is that Rabbi Hayon says nothing of the sort! That’s simply the author’s misunderstanding, misquoting, misinterpreting and misapplying of the source he quotes. I do not believe that the author of TROTKP maliciously lied, or tried to deceive anyone, however, this example does help to demonstrate how the author’s presentation in his book is based on his erroneous reading of the source he quotes. We are left with the question how did Christian/ Messianic scholars put their name behind such a book and offer the book and the author the highest praise in terms of “scholarship” and “careful research” ?? Do they not understand the glaring mistakes the author made or do they simply not care? You seem to be providing this author with clear examples of what he is trying to say. Now that is interesting. no not at all and to suggest such a thing is very misleading indeed. Not all Christian scholars accept this. But I guess the dissenters are not too well known. Trying to reason with the man is not easy. He does not believe Gentiles should challenge him. I cannot understand why Christians and messianics like the book at all unless it is a case of the emperor’s new clothes… As in the fairy tale. I am a gentile and follow the food laws in Torah, I find what he suggests revolting and cannot understand why others do not. Thank you for that. It is refreshing to read what you say. I will be directing my Jewish friends here. Sorry if this is duplicated, my iPad crashed when I was posting.